Tranquility Base: What are the odds of safely travelling to Mars? As of today, NASA's Curiosity Rover is less than 66 million miles from Mars. 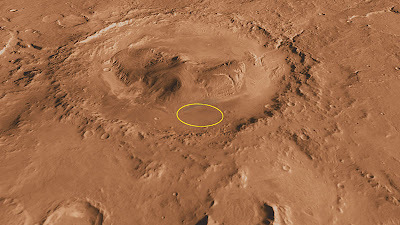 It's scheduled to land at Gale Crater on August 6. What are the odds that it will actually get there, in one piece? Curiosity's destination, Aeolis Mons, inside Gale Crater. Source: Wikipedia. If we count up every single human attempt to launch something at Mars, aimed at landing on the planet, orbiting it, or flying by, the answer is 47%. But! That's not the full story. That 47% takes into account all probe launches between 1960 and today, and we have gotten a lot better at sending things to Mars in the last fifty years. How much better? Between 1960 and 2000, 41 missions were launched. Roughly 15 reached Mars orbit, landed, or completed a fly-by. So the success rate was less than 37%. Since 2000, we've launched 11 probes, not counting Curiosity. So far 8 have succeeded- a 73% success rate! 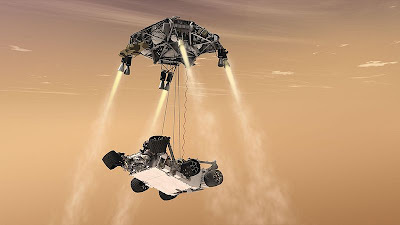 Mars Science Laboratory's planned landing. Source: Wikipedia. I'm nervous just thinking about August 6th. But at least we're trying, right? And for anyone keeping score- Earth is winning! Mars hasn't launched anything at us, besides meteorites. Meteorites and this dude. Source: Wikipedia.